Vardan Hovanissian & Emre Gültekin symbolise the reconciliation between two peoples. The sounds they produce with the Armenian duduk and the saz from Turkey are melancholy but also full of hope. 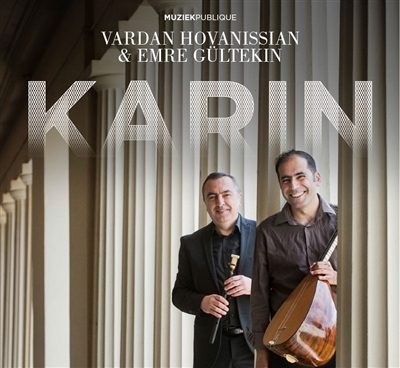 Their second album "Karin" is the ancient Armenian name for the town of Erzurum, located in what is now Turkey. It refers to the birthplace of Vardan Hovanissian’s grandfather, who was one of 200 survivors following the deportation of around 40,000 people during the Armenian genocide. The album is dedicated to the cosmopolitan period in Karin, which was a meeting place for the different cultures that existed along the Silk Road. This album sees the duo continuing their exploration of the links between Turkish and Armenian traditions. It broadens the scope to take in the richness of the musical heritage of the troubled region including Georgia, Iran and the Kurdish area. Inspired by a wandering soul and guided by a borderless friendship, the duo’s music weaves links between languages and styles. This latest collaboration is a hymn to intercultural exchanges, and it derives its strength from a spirit of sharing and generosity. It delves into the wide variety of traditional repertoires, bringing several lost treasures back to life, but also offers new compositions that address topical issues such as the fate of refugees. The lyrics pass from Armenian to Turkish, Kurdish and Georgian tracing the footsteps of the famous Armenian troubadour Sayat Nova. The melancholy air of the duduk provides a perfect counterpoint to the vibrations of the different long-necked lutes.